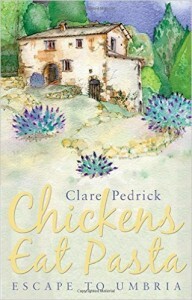 Chickens Eat Pasta is Clare Pedrick’s memoir of her first year in the Green Heart of Italy as she feels her way through home renovation, the unpredictable twists and turns of Italian laws and property ownership, new friendships, and, of course, a blossoming romance. Enamored by “images of cobbled streets and pretty stone arches,” British journalist Pedrick bought a ramshackle house in Umbria after seeing a sales video that featured a chicken eating spaghetti (thus the book’s title). Although some references are dated since Pedrick’s move was in the 1980s, the tales of expatriate relocation are not only insightful and engaging but they also transport the reader to her small community of well-defined characters—and especially to their tables for some deliciously described meals. Italophiles will surely enjoy it, but the overarching inspirational message of “following your instincts” in the pursuit of happiness gives it broad appeal as well. 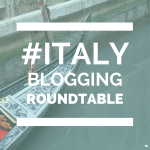 The theme of this month’s Italy Blogging Roundtable was ANIMAL. I will admit this post is a stretch to fulfill that, but hey, there’s a chicken in the title! A chicken is an animal! Gloria at At Home in Tuscany: Touch it for good luck!